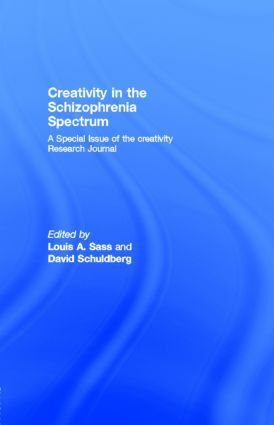 The articles in this special issue seek to re-examine the relationship between creativity and the schizophrenia spectrum of disorders in the wake of recent research and theorizing. They revisit both empirical and conceptual findings and issues regarding connections between the schizophrenia spectrum of disorders: schizotypy, psychotic-like traits, and creativity. Contents: L. Sass, D. Schuldberg, Introduction to the Special Issue. EMPIRICAL ARTICLES: D. Schuldberg, Six Subclinical Spectrum Traits in Normal Creativity. D. Kinney, R.L. Richards, P. Lowing, D. LeBlanc, M.E. Zimbalist, P. Harlan, Creativity in the Offspring of Schizophrenic and Control Parents. S. Russ, Primary Process Thinking and Creativity: Affect and Cognition. L. Sass, Commentary on the Empirical Papers. THEORETICAL PAPERS: G. Becker, The Association of Creativity and Psychopathology: Its Cultural-Historical Origins. L. Sass, Schizophrenia, Modernism, and the Creative Imagination. K. Jamison, Reply to Sass. L. Sass, Rejoinder: Romanticism, Creativity, and the Ambiguity of Psychiatric Diagnosis. J. Ogilvie, On Self-Conceiving: Philosophical Yearnings in a Schizophrenic Context. R. Prentky, Mental Illness and the Roots of Genius. D. Schuldberg, Commentary on Theoretical Papers. R. Richards, Concluding Comments.